PHILADELPHIA (WPVI) -- Clouds and a few spotty sprinkles are possible in the morning, but the afternoon features sunny breaks, a warm breeze and a high of 78. TONIGHT: Look for lots of clouds with a mild low of 64. FRIDAY (GOOD FRIDAY/PASSOVER): Low pressure to our west will draw near. Look for clouds to grow thicker during the day with some spotty, light showers here and there. Late in the afternoon, more pronounced showers and some thunderstorms are likely. Later at night, a line of drenching storms will arrive. An isolated severe storm can't be ruled out. Otherwise, look for downpours that could produce street flooding. The high is a warm 78. SATURDAY: Some lingering rain is likely in the morning. It's breezy and warm with clouds breaking for some afternoon sunshine. The high is 73. SUNDAY (EASTER): Most of the day is dry with some breaks of sun. There will be an upper level low passing through, bringing lots of clouds and a spotty afternoon shower. Morning sunrise service and any morning Easter Egg Hunts do look dry. The high is a cooler 65. MONDAY: High pressure moves in and we break out of our damp and cloudy pattern. It's at least partly sunny and a lot warmer with a high of 77. 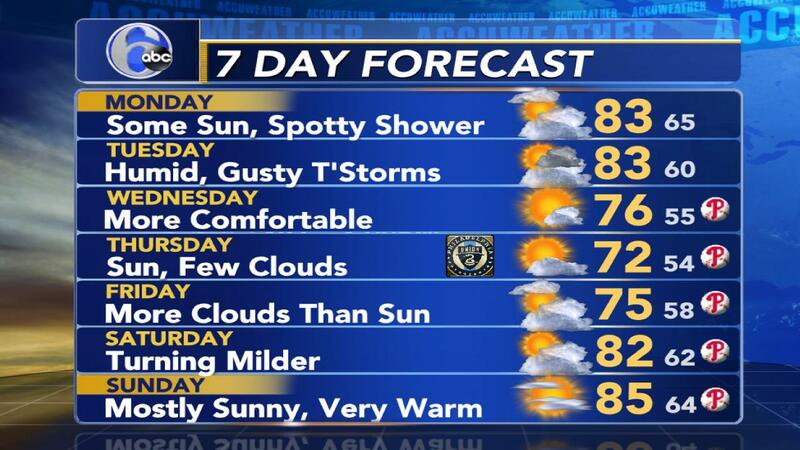 TUESDAY: It stays nice with mostly sunny skies and a warm high of 76. WEDNESDAY: Clouds return along with cooler weather. A couple showers are possible. The high is 66. THURSDAY: More clouds and more showers appear likely. The high improves to 69.